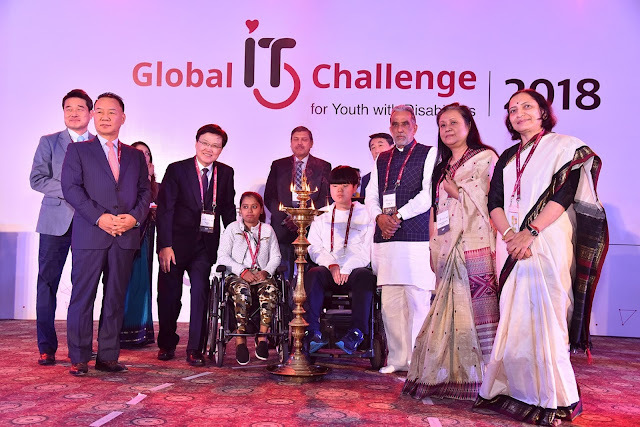 LG Electronics, a consumer durable major in India has partnered with Rehabilitation International Korea (RI Korea) to organize the 8th annual Global IT Challenge for Youth with Disabilities (GITC) in India starting from 9-11 November,2018 at The Ashok Hotel in New Delhi, India. The event will be co- hosted by Ministry of Health and Welfare (Korea) ; Ministry of Social Justice and Empowerment (Govt of India) ; LG Electronics & RI Korea. 100 youth with disabilities from 18 countries are participating in this challenge. This year candidate from United Kingdom; United Arab Emirates & Krgyzstan are participating first time in Global IT challenge for youth with disabilities. The Challenge is focused on strategies for strengthening IT skills of youth with disabilities as a critical requirement for enhancing their access to information and communication services on an equal basis with others. It will be held with a total of four events including e-Tool Challenge to evaluate the skills of using the MS Office program and e-LifeMap Challenge to evaluate the online information search ability in specific situations. To increase in demand for digital images, LG Electronics has set up a new e-Contents Challenge, which evaluates video shooting and editing capabilities. It also organizes direct stories using scratch programs and creates games and 'e-Creative Challenge' – to be held in a group. LG Electronics shall distribute teaching material co-produced by Seoul National University's MMLAB (Internet Convergence and Security Research Laboratory) and Inha University's Technology Talent Center to participants in order to solve the information gap of the youth with disabilities. They expect the participants to learn technology and utilize it in real life through informative education using textbooks. LG Electronics has been organizing the Global IT Challenges for youth with disabilities since 2011 in association with RI Korea to help eradicate the digital divide among young people with special needs and help establish a foundation for social advancement for them.